The Louisburg High School football team kept its perfect season intact Friday when the Wildcats rolled Baldwin, 27-7, at Wildcat Stadium. However, what Louisburg coach Robert Ebenstein saw on the field was anything but perfection – and he was excited about it. The Wildcats put together another highlight reel performance as they moved their record to 3-0 on the season, but no player had more game-changing plays than senior Austin Moore. Moore was a factor in all three phases of the game. He carried the ball 11 times for 111 yards and three touchdowns. Defensively, he led Louisburg with nine tackles, six solo stops, two forced fumbles and a sack from his middle linebacker spot. The Louisburg senior didn’t stop there as he also blocked a punt on special teams and he was all over the field for the Wildcats. Austin Moore celebrates a touchdown with teammates Charlie Koontz (24) and Madden Rutherford (1) during the Wildcats’ 27-7 win. Some of those others were the Wildcat offensive line of Kiefer Tucker, Jonathan DePriest, Noah Larson, Brayden White and Garrett Harding, along with tight end Michael Waldron, who opened up holes for the running game and had to make adjustments throughout the night. Louisburg didn’t waste time getting on the scoreboard as it found the endzone on its first drive. Brayden Gage set up the score with a 38-yard run to get things started and Moore took it the rest of the way as he scored on an 18-yard run to make it 7-0. 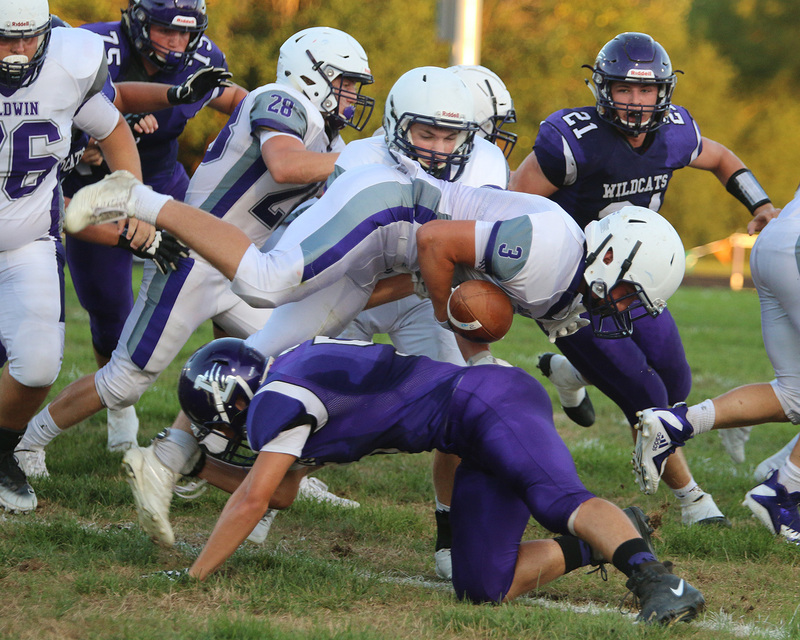 The Wildcat defense struck next as senior cornerback Beckett Rasmussen forced a fumble on Baldwin’s next drive and Blue Caplinger recovered to give them ball 29 yards away from another score. Score the Wildcats did, as Moore put Louisburg up two scores on a 3-yard touchdown run and Drake Varns converted the extra point to make it 14-0. In the second quarter, Moore and the Wildcat defense came up big again as Moore sacked the Baldwin quarterback on fourth down and forced a fumble. Senior linebacker Jorge LeBron recovered his first two of fumbles on the night and set up another Wildcat score. Senior cornerback Beckett Rasmussen takes out a Baldwin running back and forces a fumble in the process Friday in Louisburg. Moore responded with a 69-yard touchdown run on the ensuing drive, and after a missed extra point, put Louisburg up 20-0 at halftime. Louisburg had a chance to make a four-score game before the break, but the Wildcats fumbled on the goal line. 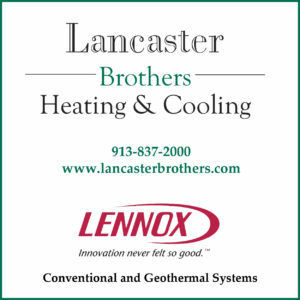 Late in the third quarter, the Wildcats put the game away when quarterback Madden Rutherford found Charlie Koontz for a 48-yard touchdown pass to put Louisburg up 27-0. Rutherford completed 5 of 8 passes on the night for 84 yards. 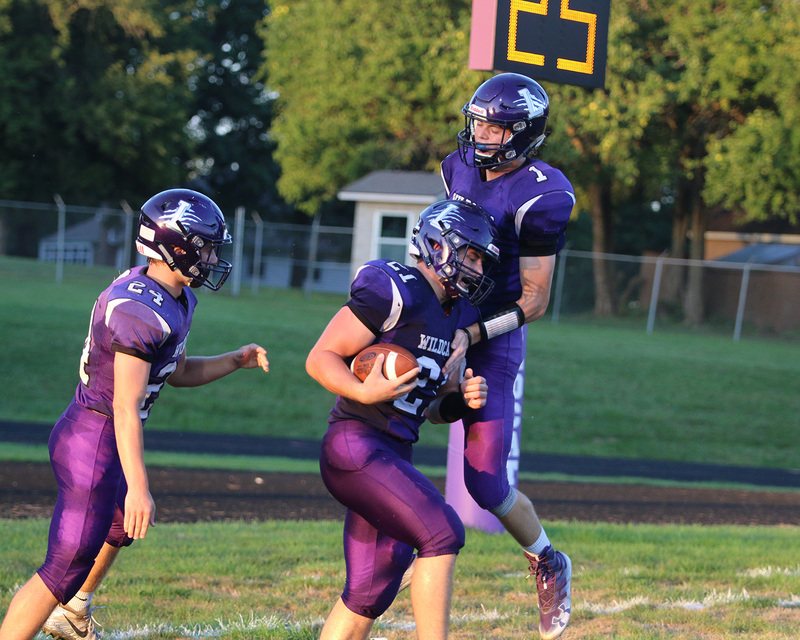 Baldwin added a fourth quarter touchdown to prevent the shutout, but the Wildcats were still able to celebrate their third straight win to start the season. The Wildcats will face their most difficult test of the season thus far as they travel to undefeated Piper for a 7 p.m. kickoff Friday. TACKLES: Austin Moore 9, Andy Hupp 7, Blue Caplinger 4, Kiefer Tucker 4, Brayden White 4, Gabe Rader 3, Ben Wiedenmann 3, Tanner Belcher 3, Noah Larson 3, Garrett Harding 3, Beckett Rasmussen 2, Charlie Koontz 2, Brandon Cooper 2, Dylan Knipp 2, Jorge LeBron 1, Brian Houck 1, Jay Scollin 1, James Foote 1, Cole Williams 1, Jonathan DePriest 1.